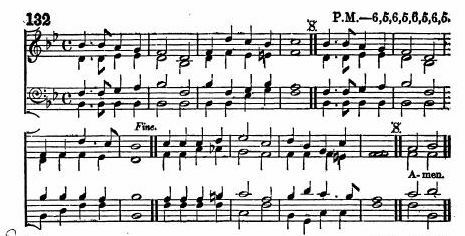 Source: Carolo Coffin, Hymni Sacri (Paris: Usuum Parisiensium, 1736), pp. 40-42. Spe subnixa fîdes corde triumphat. Infantem exhibuit matris in ulnis! Hîc præsepe, thronus; purpura, panni. Patrum plena fide corda feramus. Illo thure Deum ritè fatemur. Amborum similis laus sit Amori. Sheet Music by Chas. 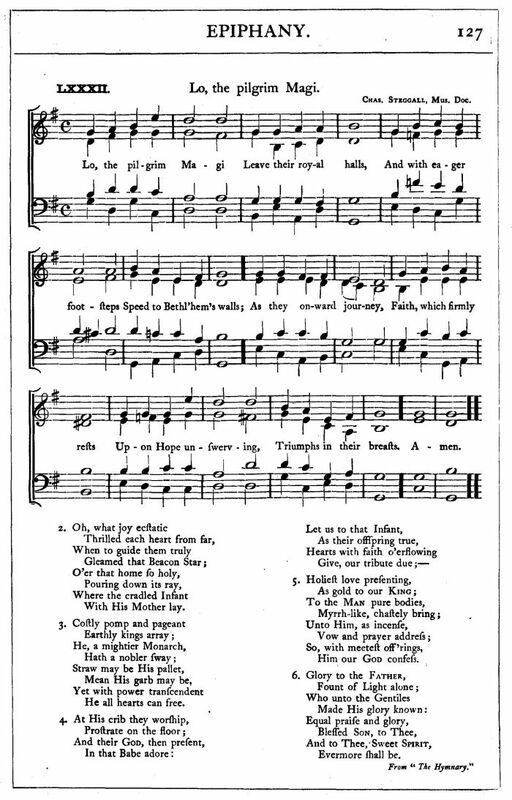 Steggall from J. H. Hopkins, ed., Great Hymns of the Church Compiled by the Late Right Reverend John Freeman Young (New York: James Pott & Company, 1887), #82, p. 127. Note from John Julian, Dictionary of Hymnology. Second Revised Edition with New Supplement. (1892, 1907), p. 677. Linquunt tecta Magi principis urbis. Charles Coffin. [Epiphany.] Included in the Paris Breviary, 1736, for Lauds on the feast of the Epiphany, and again in his Hymni Sacri, 1736, p. 40. It is also in Cardinal Newman's Hymni Ecclesiae, 1838 and 1805. 1. Lo, The Pilgrim Magi Leave Their Royal Halls By J. D. Chambers, in his Lauda Syon, 1857, p. 110. 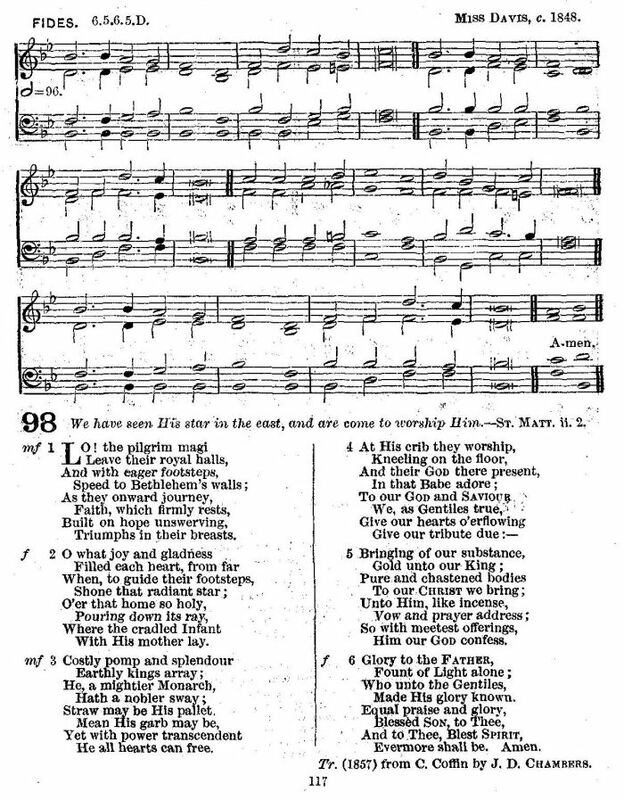 It was repeated in the People's Hymnal, 1867; the Hymnary, 1872, and others. And Version 2, Lo, The Pilgrim Magi Leave Their Royal Halls. 2. From Princely Walls in Eastern Pomp Array'd By I. Williams, in the British Magazine, 1835, and Hymns Translated from the Parisian Breviary, 1839. This Latin hymn is repeated in a number of other breviaries and sources including Breviarium Montalbanense (1842), Breviarium Tolosanum (1777), Breviarium ad usum Congregationis sancti Mauri (1787), and Weinzierl's Hymni sacri, quos ex plurium Galliae dioecesium breviariis collegit (1820), among others.